Since 2011, Stack Overflow has taken the pulse of the developer community, revealing the top trends, technologies, and work priorities for software engineers around the world. The survey always provides fascinating insight, and 2019 was no exception with nearly 90,000 developers completing it. And now the results are in. You can learn what your peers rate as the top programming languages, web frameworks, libraries, tools, platforms, and of course, databases, picking out the most loved, the most dreaded, and the most wanted. 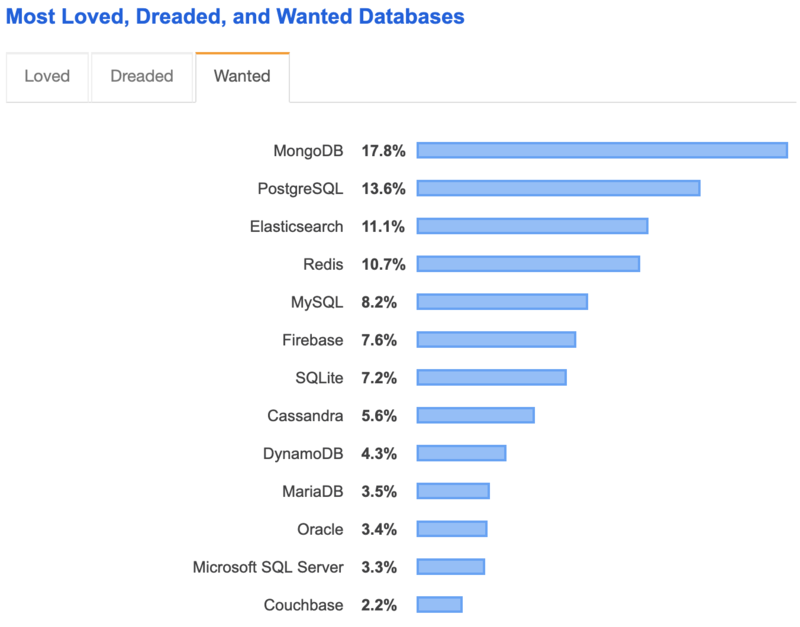 Stack Overflow created the database-specific category back in 2017, and MongoDB was rated as the most wanted then. It was top again in 2018, and now in 2019, repeats the ranking for the third consecutive year. OK, but we said in the title that MongoDB was most wanted for the past four years...so what gives? Well in 2016, before databases were given their own category, MongoDB was the only database listed in the generic roll-call of “most wanted” technologies. So what do we make of these results? Firstly, we want to thank the users of MongoDB out there whose enthusiasm for MongoDB is contagious, as the results show. They are the community that makes MongoDB better every day, innovating on some of the most demanding applications anywhere, guiding our roadmap, and educating others on how to get the most out of MongoDB. The document data model is the best way to work with data. Documents match the objects you use in code, presenting a much more natural data structure than rows and columns in a table. You can modify the document schema at any time, index on any attribute and query pretty much any way you want to support a range of operational and analytical apps – from simple point and range queries, through to complex aggregations, faceted search, geospatial processing, graph traversals. And you can have all the ACID transactional guarantees you are used to in relational databases. All of this in a single database with a single API. MongoDB’s distributed systems design means you can put data where you need it to be. Not just for high availability, for scale-out or for workload isolation to separate transactional and analytics workloads on the same cluster. MongoDB gives you the ability to locate data around the world. You can pin data to shards in specific geographic regions so local users always get low latency access, while you can meet the data sovereignty demands of privacy regulations such as the EU’s GDPR. You have the freedom to run anywhere – you can move MongoDB from your laptop to on-premise servers, to the cloud, to the fully managed global cloud MongoDB Atlas service – all without changing a single line of code. When you use MongoDB, your platform of choice becomes a deployment time decision, not a design time constraint that locks you into one provider. You can learn more about MongoDB’s design principles in our Architecture Guide. The Stack Overflow Developer Survey comes on the back of last month’s Forrester Wave™: Big Data NoSQL, Q1 2019, which recognizes MongoDB as a leader, while DB Engines Rankings show MongoDB continues to extend its lead as the world’s most popular non-relational technology. We believe all of these data points validate a path we've been pioneering to establish MongoDB as the next-generation database platform of choice. Want to learn what’s coming next? Join us at MongoDB World between June 17th and 19th in New York City, and get all of the latest news, as it happens. Want to get going right now? Get yourself a free M0 cluster on MongoDB Atlas to explore, dive into our documentation and sign up for a course at MongoDB University.